Rheumatology Department of Brazzaville University Teaching Hospital, Brazzaville, Congo. Copyright © 2013 Honoré Ntsiba et al. This is an open access article distributed under the Creative Commons Attribution License, which permits unrestricted use, distribution, and reproduction in any medium, provided the original work is properly cited. The authors report a new case of spine tuberculosis of C1-C2 occurred in a 58-year-old negative HIV patient that was responsible of inflammatory cervical pain with multidirectional stiffness and complicated by spastic quadriplegia. The diagnosis was made on the basis of presumptive elements, including cervical spinal CT scan, which showed atlanto-axial subluxation (C1-C2) with destruction of the odontoid apophysis and lateral mass of the atlas and favorable evolution under specific antibiotic treatment with ethambutol, isoniazid, rifampicin, pyrazinamide and immobilization with brace cast, despite the absence of bacteriological and anatomo-pathological evidence of certainty. The evolution has been favorable, with the disappearance of cervical pain, progressive motor recovery and resumption of autonomy of walking. Tuberculosis of the occipital cervical junction is rare and accounts for 0.3% to 1% of all cases of Pott’s disease . The clinical presentation is made of cervical pain, neurological deficit and rarely dysphagia or respiratory distress [2,3]. Lesions of the odontoid in Pott’s disease are not much reported in the literature. They range from minor damage to bone structural destruction responsible for a severe spinal instability, making the gravity of this location. On the morphological level, the computer tomography, and better, magnetic resonance imaging (MRI), describe these lesions and their distribution in soft tissue [4-6]. The biopsy and bacteriological or histological analysis show evidence of tuberculosis infection . Tuberculosis treatment associated with a rigid cervical collar immobilization is an alternative to treatment by transarticular fixation C1-C2 of the atlanto-axial instability . We report a new case of Pott’s disease localized in C1- C2. A female patient of 58 years old with no particular history was referred in January 2013 to the Rheumatology department of the University Teaching Hospital of Brazzaville in Congo for a tetraparesis. She had been complaining for two months of hyperalgic back cervical pain, with rapid progressive installation, impulsive to coughing and sneezing, with inflammatory pace and electric shocks then followed a functional impairment of the four members, associated with obstinate constipation and weight loss. The BCG vaccine history is not known. There was no tuberculosis contagion found, no fever, dysphagia, and cough or lung disease. On physical examination, the patient was in poor general condition and had a spastic tetraparesis without lesion level, with a motor deficit evaluated at 2/5 for the 4 members. The cervical spine was very painful (VAS = 10/10), stiff in all directions. Biologically, there was a significant inflammatory syndrome with an accelerated erythrocyte sedimentation rate of 90 mm in the first hour, a C-reactive protein amounting to 48 mg/l and anemia of 10.6 g/dl. The Koch bacilli search in sputum and the HIV serology were negative. 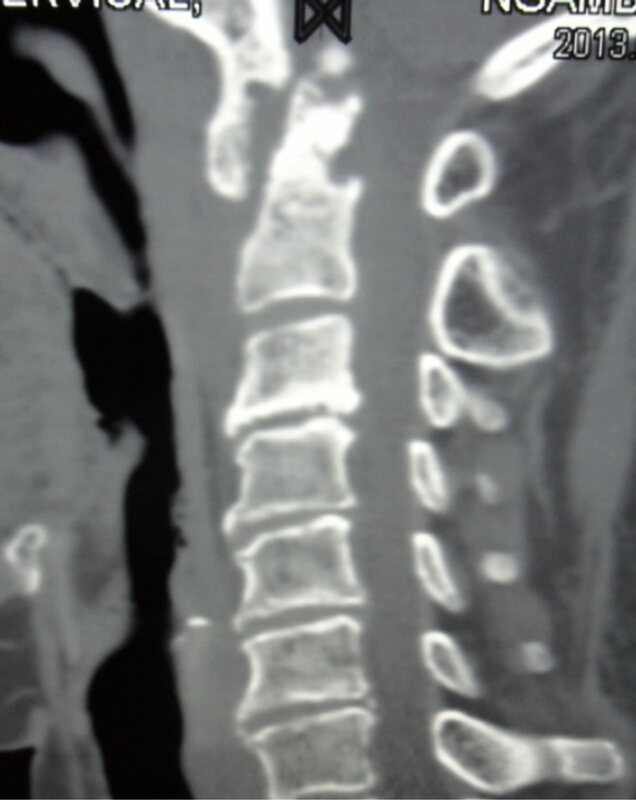 Cervical spine X-ray objectified an atlanto-axial dislocation. The computer tomography highlighted images of C1- C2 spondylodiscitis with destruction of the lateral masses of the atlas which were moth-eaten and subluxation of the odontoid with osteolysis of the apophysis (Figures 1 and 2). The chest X-ray was normal. MRI was not done as it was not available in Brazzaville; a surgical approach was not undertaken, since the local technical platform did not allow it. Figure 1. Osteolysis of the odontoid and the lateral masses of the atlas (face). Figure 2. Osteolysis of the odontoid and the lateral masses of the atlas (profile). picin + pyrazinamide), coupled with a cast immobilization by brace worn for two months have led to spectacular changes with rapid recovery and progressive autonomy in walking and complete resolution of pain. Tuberculosis of the cervico-occipital hinge is rarely reported. Only ninety-five cases have been published until 1994 . This scarcity is even more striking in our context, as Pott’s disease is the first cause of spondylodiscitis in Africa. At the clinical level, patients complain of acute inflammatory cervical pain, dysphagia. 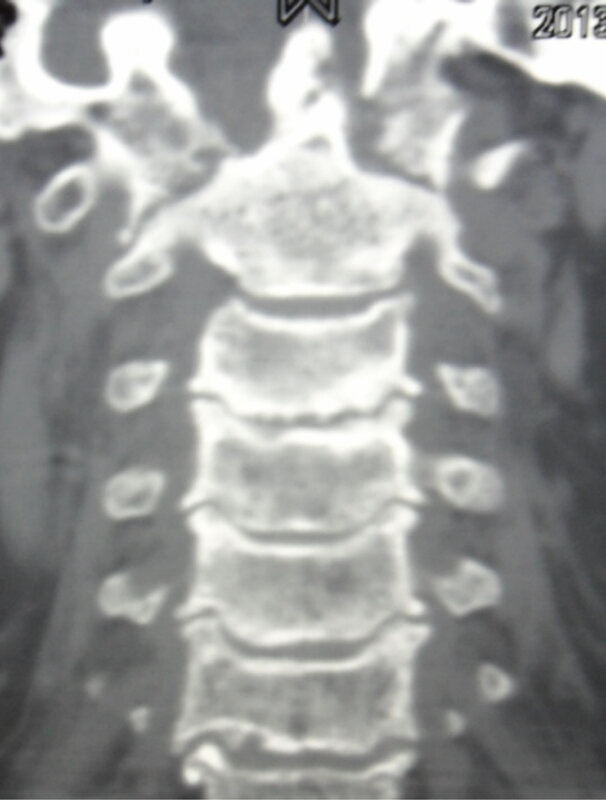 The existence of neurological complications and respiretory failure indicating spinal cord compression constitute the severity of this location and can be life-threatening [1,2,4]. The general signs and infectious syndrome may be absent and the non-specificity of the radiographic image enhances the difficulty of diagnosis. The lesions are best evaluated by computer tomography and/or MRI. They show the destruction of the tooth of the odontoid and the lateral masses of the atlas, and suffusion in soft tissues [5,6,8-10]. Pott’s disease can severely damage the odontoid apophysis and be responsible for a dislocation and an atlanto-axial instability. In these cases, surgery performed for both diagnosis (biopsy) and restoration, and to maintain alignment and stability is a good factor of evolutionary prognosis compared to medical therapy alone [1,2,6,10]. This is achieved either through a transarticular fixation C1-C2 [10-12], or an occipital-cervical arthrodesis [2,5]. However, in this environment where the technical level is insufficient or missing, recourse to medical treatment alone is almost systematic. Moreover, in the absence of open biopsy and magnetic resonance imaging, the presumptive diagnosis of Pott’s disease C1-C2 is done on the basis of clinical data, computer tomography and treatment . Indeed, in our patient who had a syndrome of acute cervical spinal pain with inflammatory pace, multidirectional stiffness, neurological deficit, an important biological inflammatory syndrome, the cast immobilization and specific medical treatment for tuberculosis, have resulted in a positive and dramatic change in a few weeks. E. Eti, J. C. Daboïko, K. F. Brou, B. Ouali, B. Ouattara, K. D. Koffi and N. M. Kouakou, “Spinal Tuberculosis: Our Experience from a Study of 147 Cases in the Rheumatology Department of the University Hospital of Cocody (Abidjan, Ivory Coast),” Médecine d’Afrique Noire, Vol. 57, No. 5, 2010, pp. 287-292.